Our homes are a reflection of who we are and what we do. They tell a story about the people who live there. What does your home say about you? Are you someone who loves to entertain, enjoys gardening, has an obsession with scrapbooking, collects books and loves STUFF? Does this story represent you in a positive light? When it comes to putting your home on the market to sell, it is just as important to declutter and simplify the closets, drawers, cabinets and anything else behind closed doors, as it is the open areas. As a Professional Organizer and someone who regularly tours open houses, I am constantly peeking into pantries, linen closets, kitchen drawers, bedroom closets and under the sink. These areas will tell you a lot about the home, the people who live in it and how well they care for the place. Your home is an extension of you. Are you always on the go? Busy, busy, busy? Are you organized and in control or are you stressed over the clutter in your life? Throwing everything in a drawer or a closet might give the appearance that you keep everything tidy and in order, but when you have potential buyers opening cabinets and closets, your secrets will quickly be revealed! 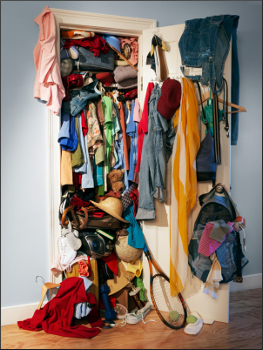 Your CLUTTER represents you, your home, how you care for yourself, your home and your home’s overall appearance. You want to have a home that looks and feels inviting, inspiring, happy and full of joy. For it to reflect its full potential, its charm and the reason why you fell in love with the home in the first place. Don’t let the things you own drag you and the price of your home down. Before putting your home on the market, make the time to purge items that no longer bring you joy, love or serve a purpose. Remove items off the floor, be ruthless with how many knick knacks are displayed on the buffet table and how many books are kept on the bookcase. But don’t forget what’s hidden behind closed doors. It is important to recognize that these spaces are just as important as the open space and fluidity of your family room, bedroom, kitchen and bath. Potential buyers will want to know what kind of storage space and options your home has. These are key selling points too. They will be envisioning themselves living in the home and where they will be storing their kid’s toys, wedding gifts and collection of figurines. If the closets, drawers and cabinets are crammed full of STUFF, the potential buyers won’t be able to see what is accurately offered. Think of your storage space in terms of time. The more things you have to look or sort thru to find what you need are time wasters. If you keep just the necessities and everything has a purpose and place, you’ll feel better and more confident about showing off your home. Here are 4 tips on how to spruce up your storage spaces to show off your home’s inner beauty and potential. Everyone has a junk drawer right? Or two or three… you get the point. Nothing is wrong with having ONE junk drawer, however make sure the items inside are sorted and contained using various size drawer organizers. Don’t let the items inside the drawer float around looking like a chaotic mess. Dump everything out. Relocate excess pens, tape, batteries, broken toys and anything that does not serve a purpose. Use small containers you may have already around your home or purchase drawer organizers from a local office supply store or Walmart/Target. Only put back the items you need at your fingertips to manage day to day life. To bump things up a notch, get beautiful shelf liners to line the inside of the drawer. This space is usually jam-packed with towels, sheets, pillows, extra bedding and many other things…just because they ‘fit’. I have found the linen closet can be used for many other purposes just by relocating towels into the bathroom where they are used and sheets/bedding to the room they will be used in. Pair down your linens to two sets of sheets per bed. Roll the bath towels and display them in a pretty basket on the floor, counter top or inside a cabinet. They can be hung from a ‘hotel like’ towel rack on the wall. Limit your bath towels to two towels per family member. This simple step can make your bathroom more inviting and appealing. Now you have freed up the storage space within your linen closet and can show this area off to eager buyers. Pantries have a way of hiding expired foods, looking disorganized and feeling cluttered. STUFF gets shoved in there. Make the time to purge expired foods and items that don’t belong. Organize the can goods and boxes of cereal. Get rid of the original packaging for chips, crackers, rices and pastas. Put these items in clear, storage containers that have locking lids. This trick will keep your food fresher longer and you will be able to see how much you have left. Create a ‘snack bin’ for individually packaged food items. Make sure to have ‘negative space’ on the shelves so the pantry doesn’t feel cluttered. Our bedroom closets hide many skeletons! This is the perfect time to purge unwanted items, clothes that haven’t been worn in the past year and shoes that no longer have a spring in their step. This will be a helpful step in preparing for your upcoming move. No one wants to see clothes bursting out of the closet or drawers of the dresser. Swap all the mix match hangers with matching flocked hangers. These flocked hangers save space, are kind to your garments and look great. Take a few minutes to use your sorting and color coding skills by lining up items from whites to blacks, short sleeve to long sleeve, skirts to pants. Show that your bedroom closet is an inviting place to walk into first thing each morning, starting the day off in a relaxed, stress-free environment. Follow these tips and your home will be sure to sell much faster.